The New Wolf Countertop Oven: Is It Worth The Price? Is It That Good? » The New Wolf Countertop Oven: Is It Worth The Price? What Can It Do? What Are Wolf Gourmet Appliances? You may chose red knobs, stainless steel or black knobs. See it here on Amazon with latest pricing, any discounts and shipping options here, as well as available knob color options. Also use the table for skipping to any other part of this review, or just continue reading. What Is A Wolf Gourmet Countertop Oven? How Old Is Wolf And Who Owns It? What Are The Main Cooking Modes And Features? What About The Main Cooking Modes? What About The Other Cooking Modes? What Will Fit In This Oven? How Does The Wolf Countertop Compare To Full-Sized Wolf Ovens? What About The Convection Oven In This Countertop & What Is A Convection Oven? What About Oven Racks And Pans? Is It PTFE and PFOA Free? How Much Does It Weigh, How Many Heating Elements Are There And How Many Watts Of Electric Power? The Wolf Countertop Oven is a small Wolf convection oven that fits on your countertop. It was introduced to the market in 2015, along with the Wolf Gourmet product line featuring several Wolf appliances. In addition to the Wolf Gourmet Countertop Oven is a Wolf Gourmet Blender, two toaster models and Wolf’s high end version of a slow cooker (see below for more information including a short video). 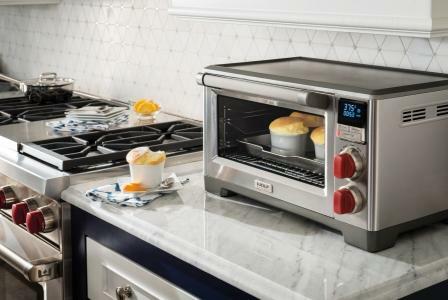 This Wolf convection oven is designed with the same attention to detail, solid construction and signature styling that has made Wolf a world-class brand in full-sized ovens, cooktops and ranges. The three convection countertop models are the WGCO100S, the WGCO110S and the WGCO120S. These models differ only in the color of the Wolf knobs that are included. The WGCO100S features Wolf’s iconic red knobs, the WGCO110S has black knobs and the WGCO120S has brushed stainless knobs. The Wolf Countertop Oven has many of the same features that are standard in Wolf’s full-sized ovens. These include a temperature probe, convection cooking, precise temperature control, timing features, 550 degree Fahrenheit broil and all in a stainless steel housing. Wolf’s longstanding reputation for quality is based on very high standards for materials and construction. Their products are solidly built. One quick way to test that solid build is to open and shut a Wolf oven door, you will notice the quality there. No rattles or noises. Wolf designs their ranges to last for more than twenty years of continuous use. They continuously test their ranges and ovens in their factory under simulated heavy use to make sure they will last in your kitchen for years and even decades. So, remember that these products will by almost any estimate last for a very long time. You are getting something that will outlast the competition. Wolf products are probably cheaper than competitor products when you divide their price by the number of years that you can use them because they are designed to last so long. Wolf Gourmet brings the Wolf reputation to its new product line. That reputation is on the line with Wolf Gourmet, since Wolf wants to make sure that its small appliance line matches the same quality levels as its full sized ovens, ranges and rangetops. Another great thing about Wolf? You can call them anytime, 24 hours, and someone in Madison, Wisconsin will answer any questions about your product. This easy telephone access great to know. Suppose you’re in the middle of preparing multiple dishes for a large dinner party, but can’t find your manual. You need to know how to set the the target temperature for your probe, but can’t remember how to do it. Take comfort in knowing that you can just call Wolf and they’ll be there to walk you through it. Wolf dates back to the early 1930’s in Los Angeles. There, brothers Al and Hyman Wolf started making better ranges for restaurants than those that they were repairing. From there, the brothers expanded the commercial Wolf brand over several years. The company grew as its reputation for quality products spread across the United States and beyond. It eventually moved headquarters to Madison, Wisconsin. In 1989, Wolf introduced its separate line of home ranges and ovens. Wolf incorporated the same quality it had built into its commercial cooking equipment into the home appliance line. That quality was quickly noticed by consumers and its name spread among home kitchens. The Wolf home range division was acquired in early 2000 by another famous brand, Sub-Zero. The Wolf Sub-Zero combination is a perfect marriage between cooking and refrigeration products. Both brands stand at the top of their categories in refrigeration and cooking products. Wolf recently extended its quality brand name to Wolf Gourmet. This line of small appliances and cookware includes the Wolf Gourmet Countertop. Wolf has by all accounts also extended its quality focus into these products. Wolf Gourmet is a line of small appliances, cookware and cutlery that was introduced to the market in 2015. Wolf intends to extend its reputation for solid build and lasting quality into this product line. Wolf developed the Wolf Gourmet line in collaboration with another iconic brand, Hamilton Beach Brands. This longstanding small appliance manufacturer has been building small appliances for about as long as Wolf has been building ranges and ovens. Wolf Gourmet appliances currently have three main products, a countertop oven, a blender (Wolf High Performance Blender) and a toaster (two models). It has also just added Wolf’s own very high end version of a slow cooker. You can see the see the Wolf High Performance Blender here with other top blenders. If you appreciate Wolf’s obsession with quality, you have to realize that none of these products are what you’d find in a typical appliance store. Wolf’s countertop oven is basically another, small (roughly 1.1 cubic feet inside before deducting racks), Wolf oven in your kitchen. It has convection cooking, a temperature probe, multiple cooking modes, including Proof, a high temperature, 550 degree Fahrenheit broiler (same high temp as conventional Wolf ovens) and several timing features. The built-in temperature probe and high temperature broiler are pretty unique in a countertop oven, but not surprising given that this is a Wolf product! The Wolf Gourmet countertop oven weighs 47 pounds! Compare that to the weight of competing countertop convection ovens. See this review of the best countertop ovens to do a deep dive on the competition and to see how Wolf Gourmet compares in several key attributes to the competition. This extremely comprehensive review even includes some more affordable, non-convection ovens that you would probably think of as toaster ovens if that’s what you’re looking for instead. You can also see a detailed review of another premium countertop oven, the Breville Smart Oven Air, here. The Smart Oven Air costs less than the Wolf Gourmet and has some nice features and is about the same size, but it’s hard to match the quality build of the Wolf Gourmet Countertop Oven. You may be surprised, for example, to see how much or how little space is actually available inside several different types of countertop ovens. Some countertop ovens appear large from the outside, but after looking inside you may be surprised to find much less space is available to fit your favorite foods around the oven racks, heating elements and other equipment inside the oven. We break that interior space down here (see below). The six modes are Warm, Toast, Bake, Roast (yes, you can cook a roast in this oven), Broil and Proof (for raising yeasty bread). For the temperature probe, use the “PROBE” function and insert the temperature probe jack in the oven wall and the end of the probe in your food, inside the oven. and tell it what temperature you’re targeting and you will be able to watch the internal temperature rise to reach the targeted temperature. If you don’t want to watch it, it will alert you when it’s ready. The Wolf Countertop also features a timer that will allow you to set cooking times and is can be set to start once your target oven temperature is reached. The timer can be set for up to 4 hours. There is also a “STAY ON” feature that will keep the oven on at the same temperature for up to 4 hours before automatically turning off. With Broil mode, you can broil just like you can in the standard sized Wolf ovens, with the same high setting of 550 degrees Fahrenheit and a low broiler setting of 450 degrees. This oven is perfect for my favorite steakhouse steak recipe. Note that Wolf Gourmet’s high temperature broil exceeds temperatures of any other countertop oven we’ve reviewed. Most other countertops max out at between 450 and 500 degrees Fahrenheit. Roast mode is designed to cook thicker meats, like roasts, whole chickens, racks of lamb and other large cuts through while also adding a crispy “browning” to the exterior. The range of temperatures available in the Roast mode is between 170 and 450 degrees Fahrenheit, or 77 and 232 degrees Celsius., The default temperature is 350 F (177 C). Bake mode is great for all things associated with baking (pies, cookies, cakes) but also works equally well for souffles, quiche, vegetables, casseroles, bread and is the best mode to use to re-heat food. Bake mode has the same temperature range as Roast mode does, 170 F (77 C) to 450F (232 C) and also 350 F (177 C) as a default temperature. Roast and Bake modes also work with the convection cooking system, just press the “CONV” button on the control panel and the convection fan will be engaged. The convection fan will circulate the hot oven air evenly around the inside of your oven to eliminate “hot spots”. Better oven circulation, allows you to cook more efficiently and faster than without convection. For convection cooking, the general rule of thumb is to reduce the temperature by 25 degrees Fahrenheit (14 degrees Celsius) OR reduce the cooking time by 25% compared with the time and temperatures for a non-convection recipe. The other three modes, Toast, Proof and Warm, round out the this Wolf Gourmet Countertop’s range of cooking performance. Toast mode allows you to toast your bread evenly on both sides by engaging the heating elements on the top and bottom of the oven. Let your oven know how many slices you want toasted, up to six, and it will fire up those elements. You can choose level of toast darkness by turning the main control knob one way or another to your preference. The control panel even remembers your last settings if you use the same setting every day. Proof mode is another great option to have with this oven. With the Proof setting, the ideal temperature of 80 degrees Fahrenheit (27 C) is set to proof yeasty bread, allowing it to rise in your oven safely and out of the way. Note that this temperature is fixed, it cannot be changed in Proof mode, but you can adjust the timer. As with other modes, the timer can be set for up to 4 hours and you can stop it at any time. Warm mode is another great option with this oven. As you might expect, this mode uses the oven to keep cooked food warm before serving it, but this mode also turns your oven into a warming oven. The Wolf Gourmet Countertop is much too versatile and powerful to be considered a warming oven, but it’s a nice option to have available when you need it. 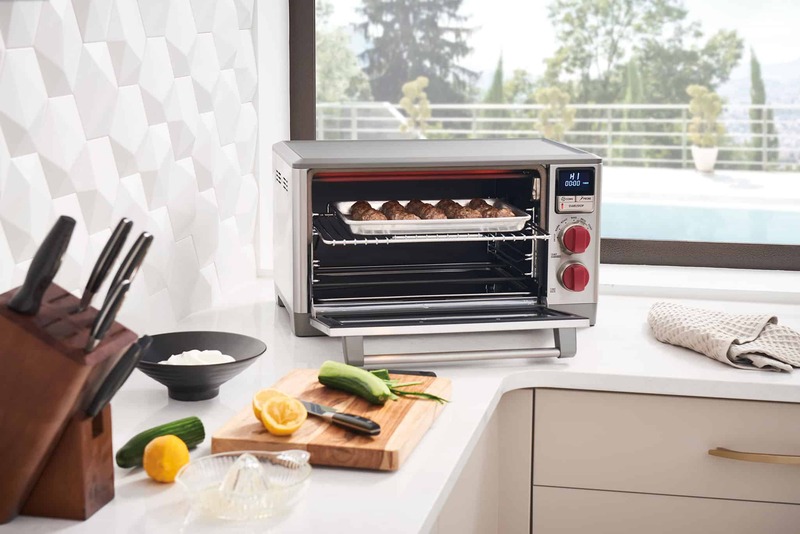 Whether you want to use this countertop oven as a first, second, third or even fourth oven, even as a warming oven, it will do everything you need to do in your other ovens. The only limitation is its size. The oven is designed to fit most 9 inch by 13 inch dishes, or a quarter sheet pan. The exterior is 22 3/8 inches wide, 12 5/8 inches high and 16 5/8 inches deep. It still gives you a lot of volume with 1.1 cubic feet of interior space before deducting for cooking racks and heating elements. It’s just not as large as a standard sized oven. If you want to measure the interior by what you can cook inside of it, know that it will fit a 5 1/2 pound chicken. If you account for the bottom rack and rack mounting on the sides, the interior width is 14.75 inches wide, 12 inches deep and about 7 inches high, from the bottom rack. Based on these internal measures, the interior volume of the oven, the “useable” oven space, is about 0.72 cubic feet after deducting for racks, heating elements and other oven components. Before deducting for these oven components and racks, the interior is about 1.1 cubic feet. Use this second measurement when comparing to other full-sized ovens. The standard sized Wolf 30 inch electric oven featured in all of the Wolf ranges (except the 36 inch range) has 4.5 cubic feet of interior oven space. This interior measurement is based on the interior cavity and not deducting for racks and heating elements. The 18 inch Wolf electric oven that is part of the 48 inch range has 2.5 cubic feet of interior cooking space, while the 36 inch oven has 5.4 cubic feet of interior space. So, considering all of these different oven sizes, you might want to look at the approximately 1.1 cubic square foot Wolf countertop as a small oven that you can mix and match with one of these other ranges. You may not need a larger sized range after all, especially if you just need another small Wolf oven but don’t need more burners or other rangetop cooking elements. The countertop will give you extra cooking capacity that is quicker to heat up than a full sized oven, saving you time and energy if all you need to cook is what will fit inside the countertop oven. It’s the perfect “in between” oven for extra oven capacity between different range sizes or even instead of a 30 inch range. The convection cooking in the countertop oven works the same way as in the standard sized Wolf ovens. A convection fan moves oven air evenly around your oven to prevent cold spots and produce even temperatures throughout the oven. This convection fan is located on the right side of the oven. When you engage it, convection cooking cooks food 20% to 25% faster because the oven’s heat is much more efficiently spread around your food, enveloping it in a warm “embrace”. As suggested above, when cooking with convection, the rule of thumb is to reduce the oven temperature by 25 degrees Fahrenheit, 14 degrees Celsius or reduce the cooking time by 25% from any standard (non-convection) recipe. One thing to note: the convection fan may not be the best thing to use when cooking “delicate foods”. Souffles or even muffins with high tops might not rise as evenly or perfectly smooth with the convection fan blowing them around! You’ll have to experiment with your favorite foods to see what works with the convection fan. The oven rack is also designed to slide out of the oven with Wolf’s “Easy-Glide” system, which makes it much easier to get hot food out of your oven when you’re “maxing” out the broiler! There are three rack positions to choose from, depending on what your cooking and it which cooking mode. The Wolf Countertop Oven also comes with a signature Wolf baking pan and broiling rack that fits inside. The Wolf countertop oven has a crumb tray at the bottom of the oven. The crumb tray is designed to capture crumbs, drips and other cooking residue. It slides out so you can clean it. You can just put it in your dishwasher (it’s dishwasher safe). Also important, the oven interior is non-stick for easy cleaning with non abrasive wipes or sponges. Wolf recommends using Signature Polish on all of its stainless steel finishes. The Wolf Gourmet Countertop oven is PTFE and PFOA free. The Wolf Gourmet Countertop oven weighs just under 47 pounds. Compare that to other countertops on the market and you’ll probably find that Wolf outweighs them. This is a quick way to measure quality, but is obviously not foolproof. You can still have a heavy oven that breaks in the first year of operation. But at 47 pounds, and with a Wolf Gourmet brand stamped on the front of the countertop, you can be confident that a heavy Wolf countertop is a solid quality oven. There are five heating elements throughout this electric oven to produce the same maximum 550 degrees Fahrenheit as standard sized Wolf ovens produce and detailed above. Also, the Wolf countertop oven is rated at 1,800 Watts. Like most other small appliances and almost all countertop ovens, the Wolf Gourmet countertops are made in China. By all indications so far (it only entered the market in 2015), the Wolf Gourmet countertop oven is a very high quality oven. Wolf has apparently maintained the same high levels of quality control in the Wolf Gourmet lines as it does with its other products that are made in the United States. It would be hard imagine Wolf risking its reputation for quality or risking the Wolf brand name on an inferior product. The warranty information detailed below should give you even more comfort. The length of the warranty should offset any remaining concerns about Wolf Gourmet products, given their how new this product line is. The warranty for all Wolf Gourmet appliances is five years. That is a very long warranty. Most other countertop ovens have only one year warranties. 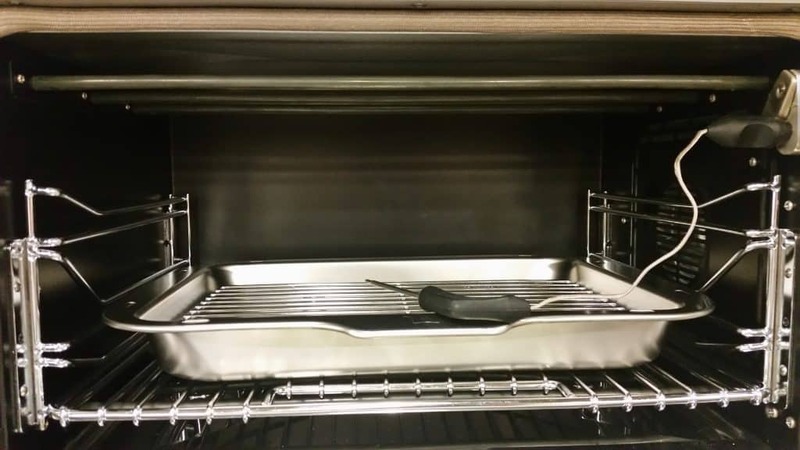 The Wolf Gourmet warranty covers defects in materials or the in the assembly of the oven. It applies to ovens purchased and used in the United States and not used commercially. Wolf reserves the option to replace or repair any defective ovens. Also note, any repair has to be made by Wolf certified service providers. You may have already been looking for a countertop oven or even another standard oven. You may have even looked at other brands, and are trying to make a decision which to buy. What you need to think about is: which one of these brands has the best quality reputation? You should probably go ahead and buy the Wolf Countertop Oven if quality is your main focus. These countertops are most likely to last the longest given their solid construction and Wolf quality focus. But even if for some reason they don’t, you have a 5-year warranty to back you up. Many reviewers, by the way, have commented that they love their Wolf Countertops for precise temperature control and a cooking experience just like cooking with their full sized Wolf ovens. Their only complaints, expressed by some, is that they wish it had an interior light. Most of these though said that the lack of an interior light was minor compared to how happy they are with the Wolf Gourmet’s performance and appearance. The Wolf brand, whether on a countertop, oven or range, definitely makes a statement in your kitchen. To see the Wolf Gourmet Countertop Oven on Amazon with latest pricing and any discounts, the available red, black and stainless steel knob models here. Your Wolf Gourmet Countertop Oven is most likely going to outlast them all. So, if you’re into cooking for the long run, you might as well buy the best. This Wolf countertop will pay for itself over many years compared to cheaper brands that will require more frequent replacing.